We are in the digital age. That being the case, it’s important that we connect with people in two ways. Today, people lead two lives — their physical life and their digital life. So, if you aren’t leveraging both touch points, you’re almost certainly leaving money on the table and missing opportunities. As an artist, you have a physical presence by default. There’s a good chance you’re already playing shows, attending open mics, going to art galleries, meeting people at exhibits and networking events, and so on. And, most importantly, you’re making art. You may not have a literal platform to stand on. Or, you may not have a way to get in front of new people every single day or every single week. But at the very least, the people closest to you already know what you do. And, if they are impressed by your work, your art may already be spreading through word of mouth. But what I’ve just described only represents one touch point. If you’re in the 18 to 44 age range, there’s a good chance you’re using social media platforms like Facebook already. But many artists find they need to overcome their fear of sharing their work with the world. Are you currently using social media platforms to share your drawings and paintings, poetry and written works, audio and video, and so on? If yes, good for you. If no, you may need to give some thought as to why that is. But here’s something many artists aren’t clued into — social media is not enough. 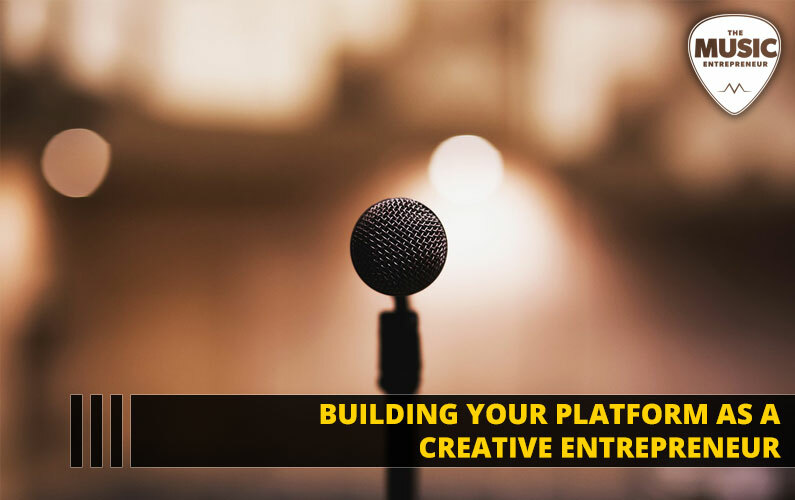 If you’re reading this now, it’s either because you’re already a creative entrepreneur, or because you’re thinking about taking a more entrepreneurial approach to your artistic career. That being the case, relying entirely on social media is a mistake. The problem with social media is that you don’t own Facebook or Twitter or YouTube or Pinterest. If they decide to shut down your account, there’s nothing you can do about it. And, what if these platforms go away? You lose your followers and all the momentum you’ve built to that point. Smart creative entrepreneurs know this and take certain steps to connect with their audience in other ways. And, most importantly, they have a way of capturing their audience’s data, namely their email addresses. I love Ralph Smart, also known as Infinite Waters. His niche is spirituality, and he uploads insightful videos on the topic daily. His primary platform is YouTube. It’s the perfect place for him to share long-form content on his chosen subject matter. As of this writing, he has nearly 1.4 million subscribers. But here’s the rub. He also has a website where he shares exclusive content. His audience can go to his website to buy his books and merchandise. Now, there’s one thing he’s not doing. He’s not capturing the email addresses of his followers. He may have his reasons for not doing this. But it’s important to recognize that your own platform is the perfect place to do exactly that — get people to sign up for your email list. Why am I so insistent on building your own platform and email list? Because it reduces risk. If a social media platform shuts you down, but you’ve been consistent with building your list, you won’t lose your entire following. Now you know why building your own website and email list is so important. But there are some traps you can fall into when building your website as well. There are many free or low-cost services that allow you to build a website on their platform. Some of these are well-intentioned, but again there are going to be some restrictions, and you’re going to end up building on a platform that belongs to someone else. What you should do is secure your own domain name (i.e. www.yourartistname.com) and hosting with a service like Cloudways. That way, you can back up your website at any time and save all your data. And, if you ever end up needing to switch to another hosting service, you can. This process may not be painless, but at least you won’t lose your following. As for building your email list, there are plenty of services like MailChimp that allow you to collect email addresses and communicate with your audience. Don’t sweat this point, because, again, they let you back up and store your list and even move it to another service if necessary. It’s true that your website represents but one touch point online. There’s a vast world of social media to take advantage of. So, here’s one way to think about this. Let’s say there’s a spiderweb and the spider is at the center. A spider, as we know, erects a web to capture his prey. This is a good analogy for how to think about our online platforms. Your website is at the center. Your social media is the web, capturing your audience at various points. Your goal is to bring your audience back to your website to engage with you. While there, they can subscribe to your email list or purchase your goods. Everyone wins. You win because you get to communicate and sell to your audience. Your audience wins because they can interact and engage with you on a more personal level. They get the opportunity to get to know who you are and what you’re about. And, if they come to know, like and trust you, it will increase the chances of them buying from you. You’re a creative entrepreneur. So, you should understand the importance of property. As you know, when you own a property, it’s yours to do with as you please. You have complete control over it. But you don’t have complete control over social media. There’s so much to see and click on. There’s so much distraction. How do you ensure people see and engage with your message? The simple answer is, you can’t! But on your platform, you can draw attention to what you consider most important, whether that’s your music, your art, your written works, your latest video or otherwise. Having your own platform gives you a good foundation to stand on.